Our Ultimate options (in limited sizes) gives unparalleled strength and durability to your log cabin. The 44mm offers 25% more than the 35mm Premium option, while the 70mm offers 100% more than 35mm premium. Both are double tongue and groove cladding and are fantastic for all-year-round domestic use or commercial applications. For a more contemporary appearance, opt for the Modern style Village Hall Log Cabin without Georgian bars to give a clean and minimalistic feel. Once again, choose Standard or Premium according to your intended use. With the ample living space that the Village Hall Log Cabin provides, that additional room you've always dreamed about will become a reality. 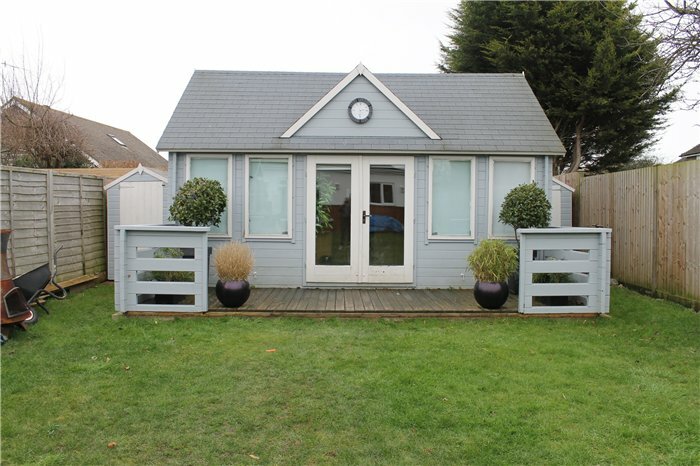 A fully featured gym in the comfort of your own home, a productive home office or perhaps an extra sitting room for relaxing with family – it's so spacious, it could be all of these at once. The impressively high ceiling and generous number of windows ensure that whatever you use your space for will be bright, airy and spacious. Whether you're sitting at your workstation or lying on the sofa, there'll be plenty of opportunity to look outside and admire the beauty of your garden and the summer weather. 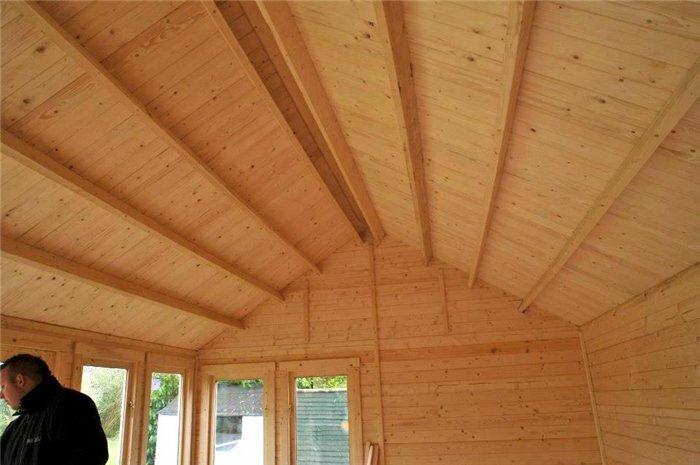 For extra luxury and grandeur, your Village Hall Log Cabin includes a roof dormer feature. The addition of a roof dormer further increases the impressiveness of your building and gives it a refined style that harks back to traditional English construction. The Village Hall Log Cabin is deluxe in both size and quality, and thus features a roof that's strong and durable to support its large dimensions and dormer add-on. With a 3.5m ridge height the ceiling is extra-tall, giving the interior an open, spacious feel. Single glazed doors and windows (to be glazed by your) or; Toughened double glazed doors and windows (pre-glazed to save you time) 19mm flooring suitable for seasonal use or; 28mm flooring suitable for high intensity usage and for year round usage 19mm roof which is stronger, this material is ideal with the shingles roof covering option. Width 445.2cm 14'7" 505.2cm 16'7" 565.2cm 18'7" 508.4cm 16'8" 568.4cm 18'8"
Depth 443.7cm 14'7" 443.7cm 14'7" 443.7cm 14'7" 435.3cm 14'3" 435.3cm 14'3"
Eaves Height (Inc Floor) 209cm 6'10" 209cm 6'10" 209cm 6'10" 204.5cm 6'9" 204.5cm 6'9"
Ridge Height (Inc Floor) 334.5cm 11' 334.5cm 11' 334.5cm 11' 344.2cm 11'4" 344.2cm 11'4"
Width (Internal) 413.4cm 13'7" 473.4cm 15'6" 533.4cm 17'6" 468.2cm 15'4" 528.2cm 17'4"
Depth (Internal) 383.4cm 12'7" 383.4cm 12'7" 383.4cm 12'7" 378.2cm 12'5" 378.2cm 12'5"
Front Roof Overhang 25cm 10" 25cm 10" 25cm 10" 25cm 10" 25cm 10"